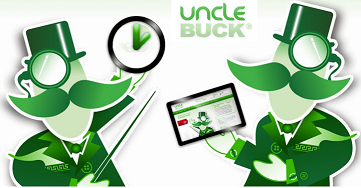 About: Uncle Buck is among the most famous UK lenders. As a new customer you can apply to borrow from £100 to £1,000 for 3 months. Once approved, you can choose the express transfer method of payment to have your funds transmitted within 15 minutes 24/7 at no extra charge..
Once you loan is repaid, as an existing customer you can apply to borrow up to £1,000 (subject to credit worthiness and affordability checks). This status will also give you the opportunity to apply for a new loan by text by using your personal 8 digit SMS code. The week preceding your payday, Uncle Buck will send you three reminders with the full amount due. You can also repay early without being charged any early repayment fee. If you have a temporary reason not to repay your loan in full, you can apply to defer the repayment but on no more than two occasions.